Hydrogels are polymer networks infiltrated with water, widely used for tissue engineering vehicles of drug delivery and novel platforms for biomedical engineering. Emerging applications for new hydrogel materials call for robustness under cyclic mechanical loads. Materials scientists have developed tough hydrogels that resist fracture under a single cycle of mechanical load, yet these toughened gels still suffer from fatigue fracture under multiple cycles of loads. The present fatigue threshold for synthetic hydrogels is reported in the order of 1 to 100 J/m2. In a recent study, Shaoting Lin and a team of materials scientists at the Massachusetts Institute of Technology (MIT) proposed the design of an anti-fatigue-fracture hydrogel. To develop the proposed hydrogel, the scientists needed the materials to have energies per unit area at a much higher value than that required to fracture a single layer of polymer chains. To accomplish this, they controlled the introduction of crystallinity in to hydrogels to substantially enhance their anti-fatigue-fracture properties. In this work, Lin et al. disclosed the fatigue threshold of polyvinyl alcohol (PVA) with a crystallinity of 18.9 weight percent (18.9 wt%) in the swollen state to exceed 1000 J/m2. The results are now published in Science Advances. 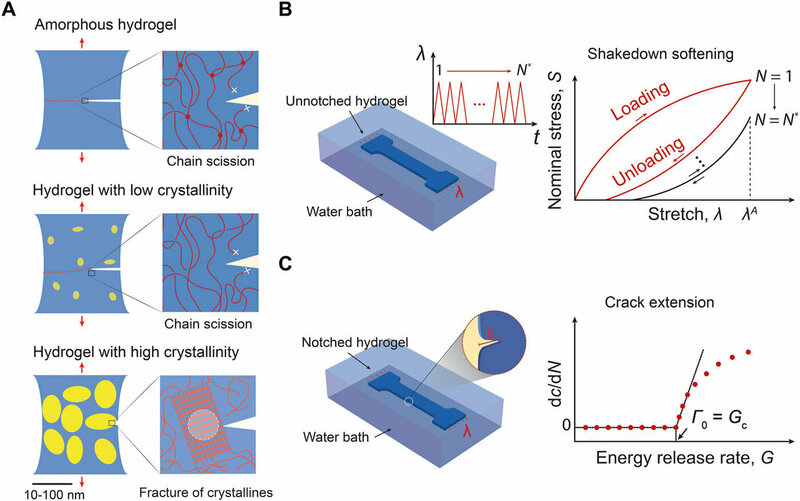 The pioneering work of Gong et al has inspired materials scientists to engineer hydrogels that are increasingly tough to resist crack propagation in a single cycle of mechanical load for industrial and biomedical applications. Hydrogels are toughened via mechanisms to dissipate mechanical energy, such as the fracture of short polymer chains and reversible crosslinks into stretchy polymer networks. Yet, the existing tough hydrogels suffer from fatigue fracture under multiple cycles of mechanical loads. The highest fatigue threshold on record so far is 418 J/m2 for a double network hydrogel, poly (2-acrylamido-2-methyl-1-propanesulfonic acid) (PAMPS)-PAAm. The outcome is credited to the high intrinsic fracture energy of the PAAm network with very long polymer chains. Biological tissues such as cartilage, tendons, muscles and heart valves with extraordinary anti-fatigue properties are comparatively superior to synthetic hydrogels. For instance, the biomechanics of fracture energy in the knee joint after prolonged cycles of loads is above 1000 J/m2. This is due to the inherent, anti-fatigue properties of biological tissues based on highly ordered and partially crystalline collagen fiber structures. Lin et al. were inspired to develop biomimetic hydrogels centered on such anti-fatigue properties of biological tissues. Their hypothesis was that increased crystallinity in synthetic hydrogels could increase the fatigue threshold of the material, therefore the fatigue threshold in such biomimetic materials will be higher since crystalline domains had to be fractured for crack propagation. The scientists then created kirigami hydrogel sheets that were highly stretchable and resistant to fatigue fracture. 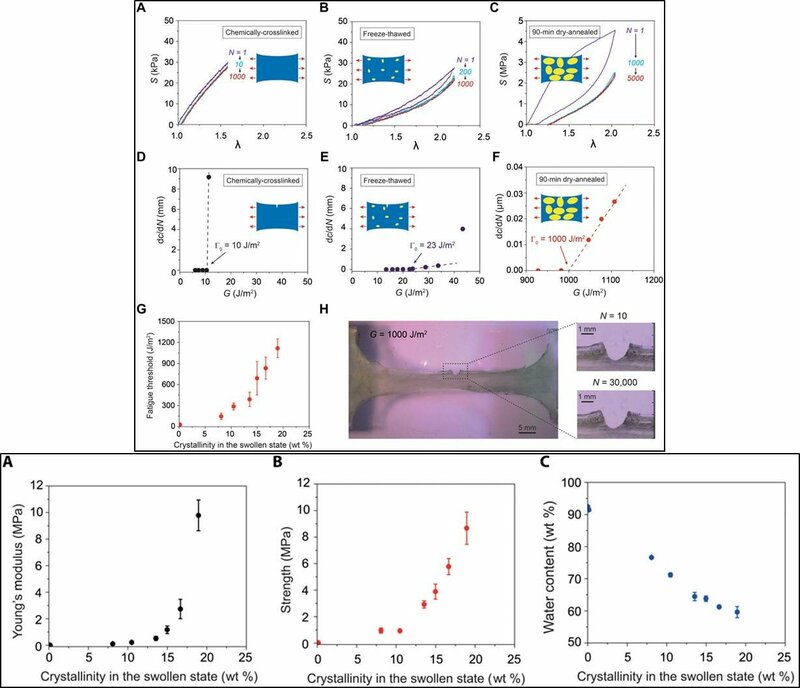 They based the hydrogel models on a strategy to maintain high water content and low moduli, while rendering the hydrogels resistant to fatigue fracture. 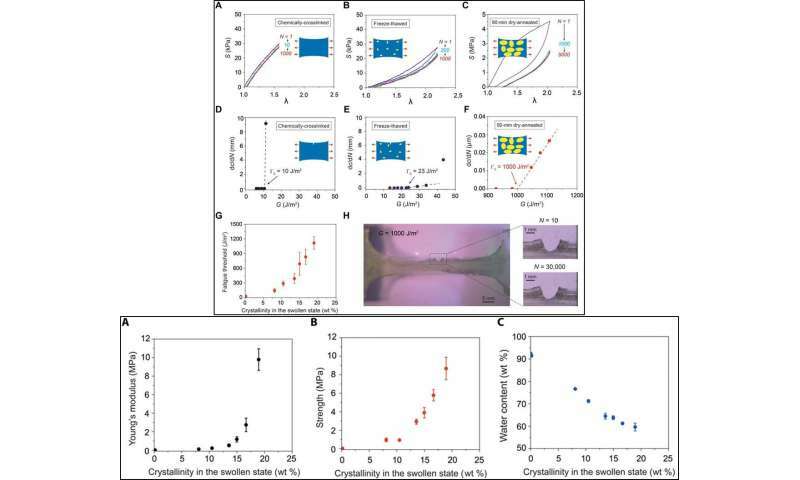 The new work revealed a new anti-fatigue-fracture mechanism in hydrogel development, as well as a practical method to design such hydrogels for diverse practical applications. To form hydrogels crosslinked by crystal domains during materials development, the scientists first froze a solution of uncrosslinked PVA at -20 degrees C for 8 hours and thawed it at 25 degrees C for 3 hours. This was followed by further drying in an incubator at 37 degrees C and annealing at 100 degrees C for a variety of time ranges from zero to 90 minutes. As a control, the scientists also fabricated a chemically crosslinked PVA without crystal domains (amorphous polymer network). 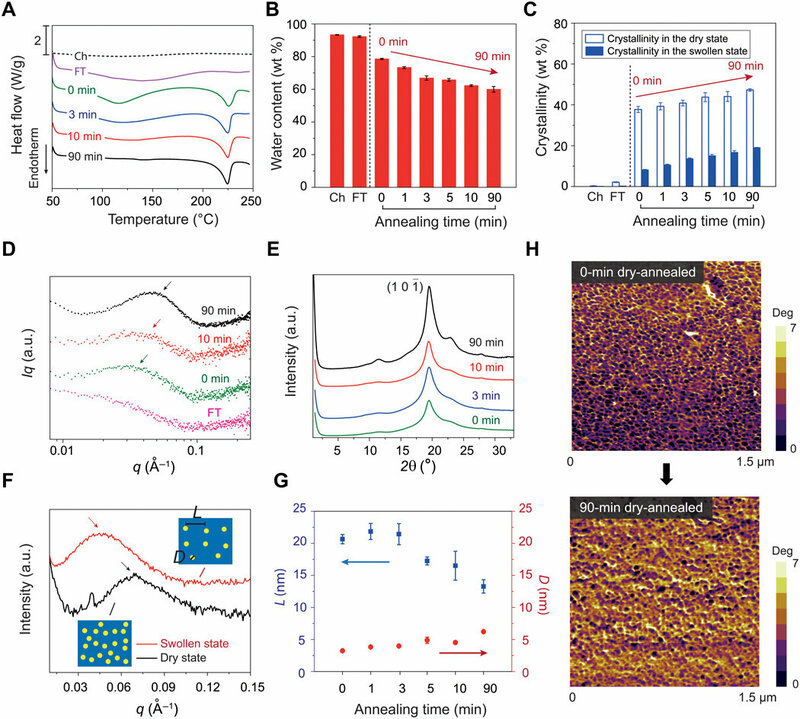 To measure the crystallinities of the resultant PVA hydrogels in their dry state, Lin et al. used differential scanning calorimetry (DSC). The crystallinity of the PVA samples increased in the dry state and further evolved with increased annealing time. To quantify evolving crystalline morphology of the samples, the scientists used small angle X-ray scattering (SAXS) and wide-angle X-ray scattering (WAXS). 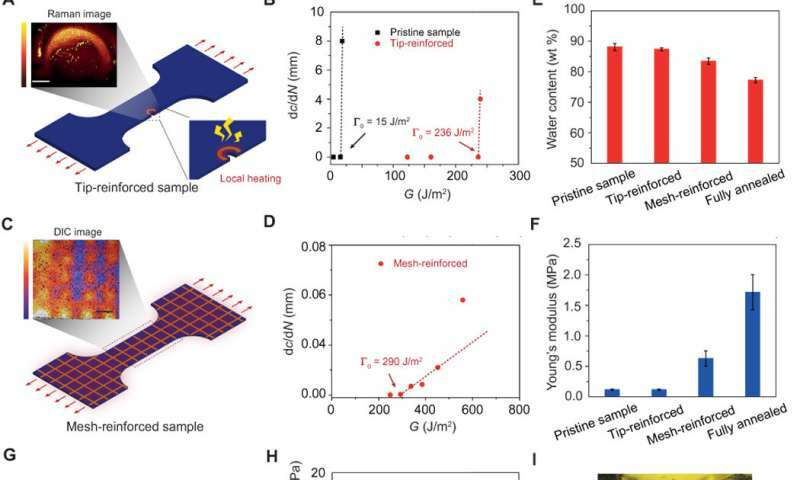 To validate tuning of the crystalline domains in the PVA hydrogel with increased annealing time with phase images, the scientists used atomic force microscopy (AFM). The resulting images showed bright areas of relatively high modulus (corresponding to the crystalline domain) and dark areas of relatively low modulus (corresponding to the amorphous polymer). To perform all fatigue tests in the study, Lin et al. used fully swollen hydrogels immersed in a water bath to prevent dehydration-induced cracks. Using dog bone-shaped material samples, the scientists performed cyclic tensile tests and systematically varied the applied stretch. As the stretch increased, the crystalline domains transformed into aligned fibrils along the loading direction. 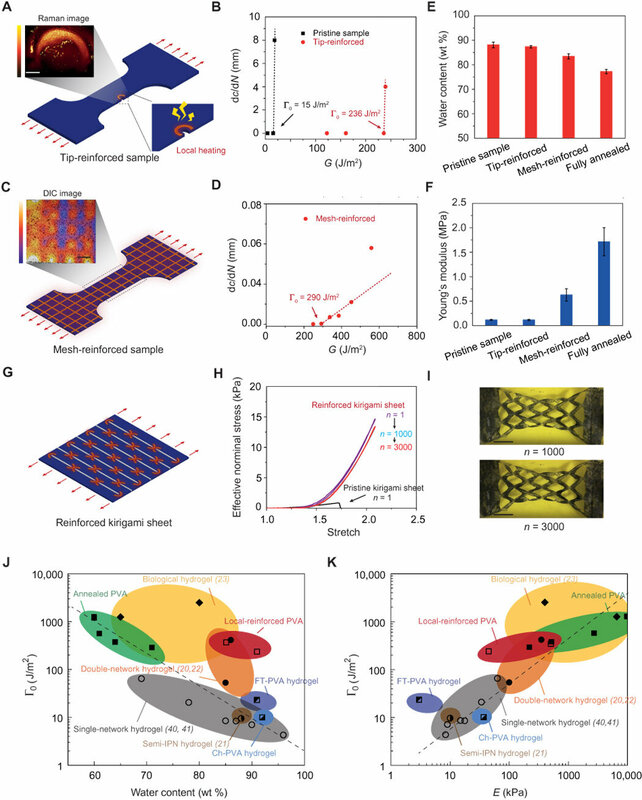 The energy required to damage the crystalline domains and fibrils was much higher than that required to fracture a single layer of the same polymer in its amorphous state. The scientists quantified the dependence of the fatigue threshold on the crystallinity. Both Young's modulus and the tensile strength of the hydrogels increased with crystallinity. Lin et al. then proposed another strategy to introduce specifically programmed, highly crystalline regions in the hydrogels. For this, they used computer-aided design of electric circuits to induce localized heat treatment to anneal selected regions of the hydrogels. As examples of the procedure, Lin et al. locally introduced a highly crystalline ring-shaped region around a crack tip. Despite the small area, the alteration caused a fatigue threshold of more than 236 J/m2 to delay crack propagation. As a second example, the scientists patterned mesh-like highly crystalline regions on the pristine hydrogel. The alternation conferred a fatigue threshold of 290 J/m2, relatively low Young's modulus (627 kPa) and high water content (83 weight percent), compared with the pristine unmodified hydrogel. Lin et al. then compared the fatigue thresholds, water contents and Young's modulus of hydrogels reported in literature. They showed that by patterning highly crystalline regions, tip- and mesh-reinforced PVA hydrogels could outperform the existing synthetic hydrogels. The materials can also maintain relatively high water content and low Young's moduli. 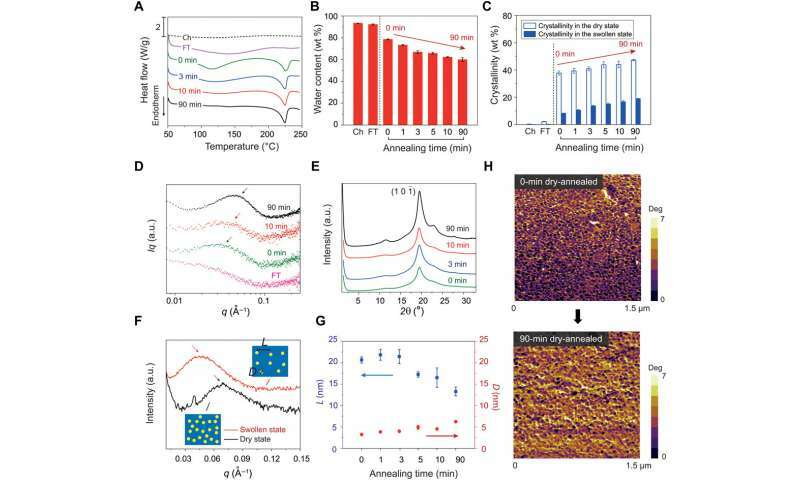 The scientists aim to apply this strategy of patterning to highly crystalline regions of various structures of hydrogels to improve anti-fatigue performance. In this way, enhancing the anti-fatigue-fracture performance of hydrogels can contribute to a number of applications and research directions in advanced materials. In biomedical engineering, anti-fatigue hydrogels can be used for hydrogel-based, implantable tissue replacements of the meniscus, invertebral disc and cartilage. These medical translations require mechanical robustness for long-term interactions with the human body. The newly developed anti-fatigue-fracture hydrogels can offer a novel materials platform for biomedical and industrial applications. Drug delivery and targeting. Nature. 1998 Apr 30;392(6679 Suppl):5-10. www.ncbi.nlm.nih.gov/pubmed/95 … Abstract&holding=npg Yu Shrike Zhang et al.